Filled with reassurance and support, the book has heart-warming true stories, take-action checklists and more than 200 helpful tips. Why is your smart, perceptive son suddenly struggling at school? Are daily arguments about homework turning your home into a battle zone? It is no secret that boys are falling behind in education, with fewer young men graduating from high school and enrolling in college. The authors turn fear and guilt into can-do confidence through easy techniques and achievable solutions. 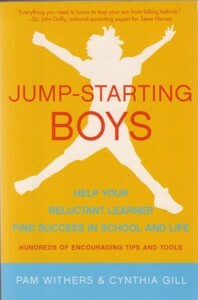 The book targets concerned parents and helps them work with their sons to make sure they beat the odds and become lifelong learners. It shows how to determine your sons’ learning styles and how best to help them learn and strengthen their memories. The authors show you how to encourage them to appreciate math and science (even if you do not); engage reluctant readers via book clubs, graphic novels and kinesthetic activities; limit screen time without coming across as a tyrant; and use an interest in technology to foster excitement about learning and forming good homework habits. $16.95 — Viva Editions, an imprint of Cleis Press, Inc., 2246 Sixth St., Berkeley, CA 94710.